Stumbling across this demo tape from Portland, Oregon-based duo Bewitcher, I didn't realise that I was in the mood for it until I heard it. 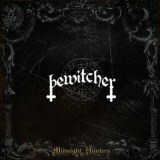 Like a sped-up version of blackened rockers Midnight, Bewitcher's soul is in the 80s, sounding somewhat like early Darkthrone gone thrash. It's very much metal comfort food, from unfussy song titles like Speed 'til You Bleed, to the names of the members: Infernal Magus of Nocturnal Alchemy and Unholy Weaver of Shadows & Incantations. And the music itself is deeply satisfying, three tracks of exuberant metal that kicks off with a classic King Diamond-esque shriek and a blast of drums, said opener Speed 'til You Bleed galloping along like Aura Noir at their best. For an unsigned band on their third demo, this is terrific stuff, guitar layers perfectly placed in the solid production (which accentuates the bass nicely) and instrumentally tight performance. The songwriting, as if you need to be told, is sharp-edged and infectious, carrying you along with the band's clear enthusiasm for the music. It's hard to criticise at all, really. The title track is the longest of the three here, but still comes in at well under four minutes and fills plenty of that time with widdly soloing - which is always a great thing in black/thrash - and closer Rome is on Fire gets its head down and plows along like a Motörhead that has discovered Satan, even throwing in some epic chanting. Nothing particularly original, all in all, but Bewitcher are good enough at this to be worth your time, and I can't wait to hear more from them. All their demos are available from the Bandcamp link above, but if nothing else remember the name, as greater things are to come from this duo.